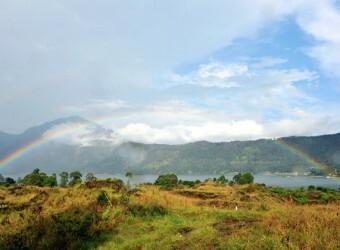 Mt Batur is situated 1717meters. Around the area is well known Kintamani as the great view place of Bali. It is cool even in daytime, you can see Lake Batur as called “Water Tank of Bali” at your feet, and if you go down to the lake side through winding road, there are some sightseeing spots, such as Toya Bungkah hot spring, and Truyan of Bali Aga village, etc. I went there on tour includes lunch. There are a few restaurants overlooking the mountain. It was a little cool in the mountain area, so I recommend you bring haori if you come here. I felt that I got natural energy from a spectacular view.